What Are You Entitled To When You Leave Your Job in California? Home » Blog » What Are You Entitled To When You Leave Your Job in California? If your employer does not comply, you may be entitled to recover damages. We have all been there: leaving a job for any number of reasons, and waiting impatiently for our final paycheck and other paperwork. Many workers have been in a situation where their employers are all too eager to get back their own documents, files, and other items, like office keys. But what many California employees do not realize is that their employers have certain obligations under the law — and that if they do not comply with these rules, they may face certain penalties. According to a skilled employment attorney, both California and federal law have strict requirements for what employers must provide to employees who leave their company. Some of these documentation requirements will depend on the size of the company and the facts of your employment, such as whether you participated in the group health plan. For example, if you were on the company insurance, your employer must give you a COBRA notice and election form before they terminate your employee benefits. In addition, a notice of Cal-COBRA continuation rights must be provided if you were terminated and are covered under the law. In addition, certain employees must also be given a Health Insurance Premium Payment Notice. If you had any other employer-sponsored insurance coverage, California law requires your employer to give you notice of how you can continue, convert and/or extend this coverage. If you were terminated, you must be given certain information about your rights to unemployment benefits. In California, this includes the “For Your Benefit” pamphlet, and a written notice under the unemployment insurance code informing you of the change in your employment relationship. Beyond the paperwork, what most employees want is their final paycheck. If you quit and give at least 72 hours of notice, you are entitled to a paycheck at the time of separation. Otherwise, you are entitled to a final paycheck within 72 hours of the notice. 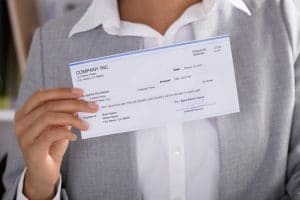 The final paycheck must include all unpaid earned wages, which includes all unused vacation pay and paid time off, overtime wages, and regular wages. Commissions and bonuses should also be included in the final paycheck, or paid as soon as the amounts are capable of being determined. If your employer does not provide your final pay on your last day of work, he or she can be penalized in an amount of a day’s wages for each day of delay, up to a maximum of 30 days. If you have to engage an employment attorney to file a legal claim to recover your unpaid wages and penalties, you can also recover the cost of your attorneys’ fees. There are a number of laws that employers must follow when you leave your job, which serve to protect you, the employee. If your company does not provide you with the required notices or your final paycheck, it could prevent you from exercising your rights — or being able to pay your bills. That is why it is important to know your rights, and to contact a skilled employment attorney if your employer does not provide you with the required information. At PLBSH, we have more than 40 years of experience representing employees. We will fight for your rights. Contact us today at (800) 435-7542 or info@plbsh.com to schedule a consultation with an experienced employment attorney.